There’s hundreds of techniques you could use to build/attract links to your website. Each technique has different requirements, costs, time to implement and effectiveness. Here’s 4 link building techniques which we don’t use for clients, for various reasons explained below, but you can do for yourself effectively. Relationship building isn’t a link building technique per se but a layer that you can add to many other techniques to make them more effective. The idea is to build relationships with those that have the potential to link to you and/or convince others to link to you. The fact that you have a relationship with them will make them both more likely to be aware of your linkable assets and have the motivation to add links to them. If these people seem too big and famous (in your space) to be reachable, its probably still worth having a go because you might be pleasantly surprised but you can also try targeting people further down the list ie. the ‘B’ and ‘C’ listers. This should naturally get you on their radar which will make it more likely for them to see your content and generally more motivated to link to it if its good and relevant. Don’t be afraid to reach out to them every now and then and ask them to share your content or even link to you if relevant. Leave insightful comments on blog posts to start building a relationship. Why don’t we use this technique? If you want to leverage someone else’s event using one of these techniques, first you’ll have to find an event to get involved in. In most cases you’ll be doing this for free for the publicity and marketing opportunities (including link building) rather than getting paid, unless its a really big event. Promote the events you’re involved in to related websites and they might write about you and include a link. Here’s some specific tips for each method. You’ll need a space suitable for hosting an event. At the basic level this means enough space to fit everyone in and a location which is convenience for people to get to. 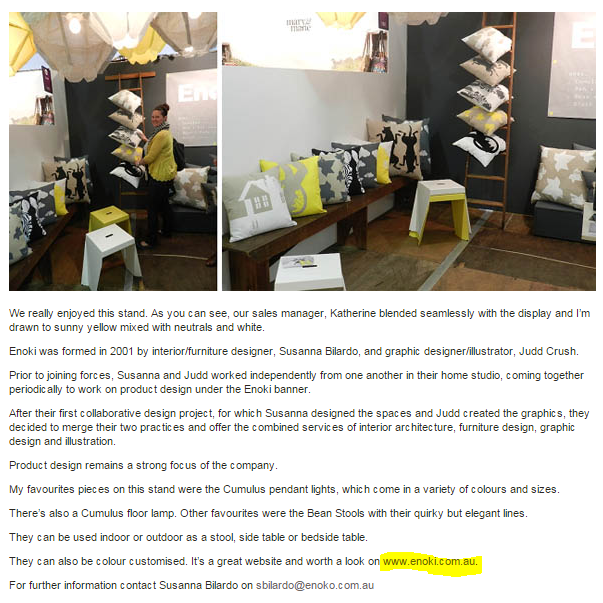 Interior design company ‘Enoki’ gained several links after they exhibited at the Life Instyle trade show and attendees blogged about it. You can leverage many of the techniques and tips I’ve mentioned above for your own events as well. Further, if people reach out to you to host, speak or exhibit at your next event, consider it because they’ll help you with promotion and probably link from their websites back to yours. This technique is fairly simple and can be quite effective. Essentially you offer bloggers and other websites your products and services for a free or cheap in exchange for them considering reviewing them/you on their websites. When they write about you, there’s a good chance they’ll add a link as well. This technique is effective because there’s a strong value proposition for the reviewer; they get a free or cheap product/service and something to write about on their website. However, you need to be careful that you’re not giving a freebie in exchange for a link, which is against Google’s guidelines, or in exchange for positive press, which is against consumer laws. I covered the dangers of this technique in more detail here: Bloggers & Brands: You’re Doing it Wrong (SEO Edition). This technique is most suitable for those with lower priced product and services. If you have a higher priced item, think about how you might be able to provide a sample to bring the cost of your offer down. 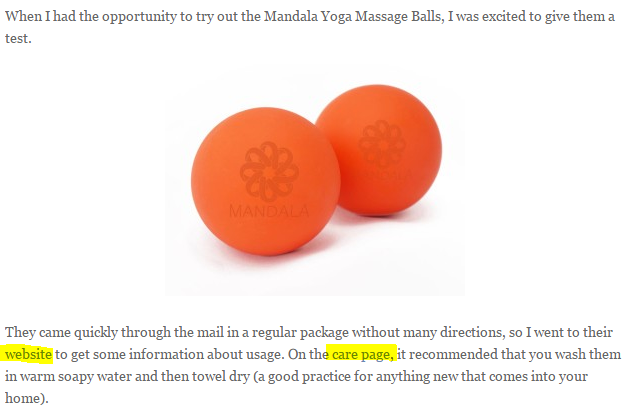 Here’s an example of a blogger reviewing some massage balls as a result of a review campaign by the brand. Utilise services such as ‘Bloggers Required’ to find bloggers to review your products and services. Competition variation: one variation on this technique is to offer a free product or service for the blog or website to give to someone in their audience via a competition. There’s a similarly good value proposition here as the website has something to write about and pass value onto their audience. It will be quite natural for them to include a link to your website and/or product page when writing about the competition. Most of our clients prefer ‘hands off’ campaigns which isn’t possible with this technique as you need to be crafting offers arranging for deliver etc. 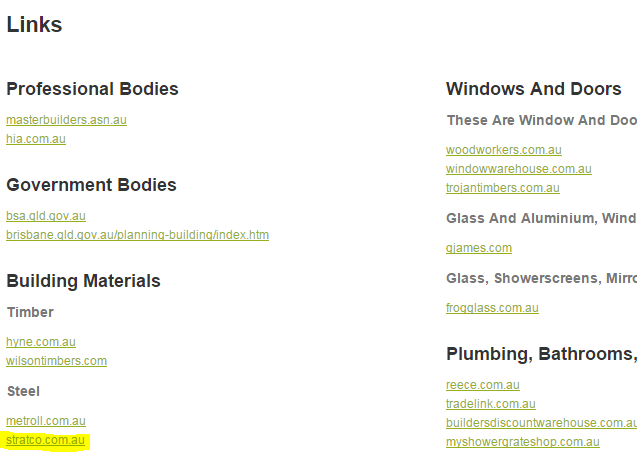 Stratco has many links from businesses that use their products and refer to them at the supplier. With most of these affiliation types, links will only be added if there’s already precedent for that happening with their existing affiliations. Therefore, you should look to see if they already link out to other affiliation partners and, if they do, you’ll have a good case for getting a link to your website too, if you become affiliated. However, there are exceptions to this so if there doesn’t seem to be any linking precedent, there’s no harm in asking. Most of these techniques aren’t worth doing for link building alone, but are rather opportunities to gain links from affiliations you already have. After hearing all about the techniques we don’t use, you might be wondering what techniques we actually do use to gain links for our clients. They are both effective and efficient which means there’s a relatively high links-effort ratio, unlike many of the techniques discussed on this page. We can start them at any time and go at our own pace. We can execute our campaigns with little to no input from the client. We find that most of our clients have too much on their plates already. Links are a vital part of Search Engine Optimisation. There’s many techniques you can use to get them, each of them have different costs, requirements, pros and cons. The four techniques described here are not a good fit for our services which is why we don’t use them but they can still be effective for you to do in house.